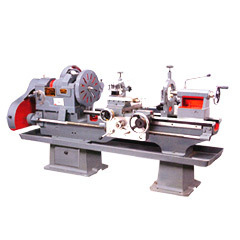 In these heavy duty lathe machinery, the bed castings are made up of close-grained cast iron with excellent finishes. Therefore, these machines are well capable in withstanding vibration during their operation and execute hassle free operation. The beds are firmly braced with cross ribs that enable them in steady and smooth performing during surfacing, heavy turning, screw cutting etc. The high degree of working accuracy can be availed through out their entire working life period. Further, to avoid harsh seasonal effect & unevenness, the head stock castings are finely graded and seasoned. By using superior quality lead bronze metal, the brass bearings are prepared that provide good lubrications and vibration-free operations. For further high efficiency, all the principle components of these machines including saddle, spindle, apron, gears etc. are provided with sturdy and heavy designs. These bring high efficiency and high rigidity of these machines. One of the leading domestic supplier, exporter and dealer of industry, wood working, sheet metal, food processing and constructional equipments.